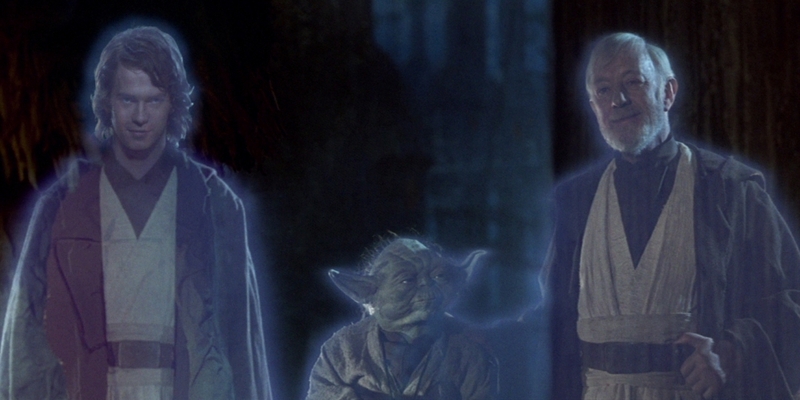 One of the classic tropes of the Star Wars franchise is the appearance of Force ghosts, fallen Jedi Knights who have become one with the Force and live on in spirit so they are still there for the pupils who need them. They did not appear in the prequel trilogy, but director J.J. Abrams toyed with the idea of bringing them back when he was piecing together Star Wars: Episode VII - The Force Awakens. Shortly after the movie's release, concept art of an Anakin Skywalker ghost torn between the Dark and Light sides of the Force emerged, piquing interest in what was cut during the film's development. Perhaps the most famous Force ghost in all of Star Wars is Obi-Wan Kenobi, who provided guidance to Luke Skywalker in both The Empire Strikes Back and Return of the Jedi before Luke defeated Darth Vader. While Force ghosts were left out of The Force Awakens, there's always a chance they return in Rian Johnson's Star Wars: Episode VIII, and one rumor suggests that Ewan McGregor - who played Obi-Wan in the prequels - could reprise Kenobi in the upcoming sequel. Grain of salt: hearing that Ewan Mcgregor in talks to play Obi Force ghost in Episode 8. There isn't much to discuss about the rumor itself (just that McGregor could be returning), but it does provide an opportunity to pose the question: should McGregor play an Obi-Wan Force ghost in Episode VIII? It certainly is an interesting proposition, and probably one Lucasfilm would be up for. After all, Abrams did bring McGregor in late the game to record a line of dialogue for The Force Awakens. And the actor is more than happy to be part of the franchise again, saying that he waited for a call from Lucasfilm for years. Odds are, viewers will see Luke's former teachers on the big screen again in some capacity. It was recently revealed that a Yoda scene was cut from Episode VII during development, even after Frank Oz did "a whole bunch of Yoda." Lucasfilm seems intent on having the old Jedi Masters play some kind of role in a future film, and it would make sense. If Star Wars 8 is to have a bigger part for Luke, him seeking counsel from his allies could factor into the story (especially if he has any doubts about his own ability as an instructor). Even though Luke is in isolation at the end of The Force Awakens, he was most likely communicating with Obi-Wan and Yoda throughout the years between Return of the Jedi and Star Wars 7, creating a fascinating dynamic between the characters as Luke has gotten older. Should Lucasfilm move forward with this, they would have to be very smart with the way they handled a Force ghost appearance. Episode VIII has plenty to unpack, continuing the stories of all the characters introduced in The Force Awakens, welcoming newcomers to the fold (Benicio del Toro), and following returning classic trilogy heroes such as Luke and General Leia Organa. Depending on how everything comes into place, there may or may not be a natural place to fit an Obi-Wan Force ghost, even if it would probably be a glorified cameo like in the original films. After The Force Awakens was so successful in blending the veterans with the new blood, Lucasfilm would want to make sure that Obi-Wan had something substantial to contribute and wasn't just a forced bit of fan service. It's also important to keep in mind that nothing could come of this at all. Back in 2013, it was rumored that McGregor was going to play a Force ghost in Episode VII, which obviously did not happen. Films are constantly going through changes as they make the journey from script to screen, and in some cases the final picture is not locked until a month before the premiere. An Obi-Wan Force ghost could merely be an idea that Johnson and Lucasfilm are tossing around right now as they prepare for principal photography and they'll make a more concrete decision on the matter later on. Case in point, Johnson just completed some rewrites of the screenplay, so the movie's narrative is anyone's guess at this point. In the end, as fun as it would be to see Obi-Wan (or Yoda) back on the big screen sharing wisdom, it's only something that should be done if it's logical for the main plot. Shoehorning in classic elements wouldn't do anybody any favors, and it would be disappointing for longtime fans if the legendary Jedi Masters didn't have something meaningful to do. Time will tell if McGregor will come back to play an elder Kenobi, though it sounds like something both parties are privy to. And even if the actor doesn't appear in the sequel trilogy, there's always a chance he stars in his own Obi-Wan anthology film.